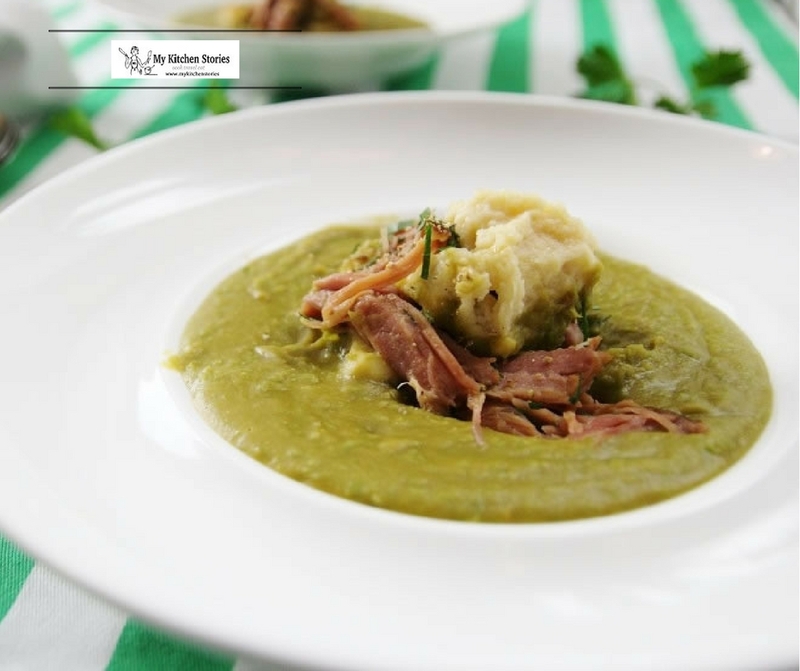 This vibrant Green Pea Soup is delicious with smoked ham and who can pass up a little dumpling action too? I was watching an episode of Australian Master chef this week. The contestants had to make a soup. Of course the soups that they made were not the everyday soup you might make after a long day at work but the sentiment was the same. One of the contestants said something that really made me think. “Soup always reminds all of us of home. Everyone grows up eating soups in the winter, like a warm hug from Mum”. This made me feel upset and inadequate ……. I haven’t hugged my son in years….. his rejection of soups in the past has left me without a weeknight soup on his menu plan. We had a talk tonight. ” Skater” , I said, “You have to eat soup”…..
“Soup?” he said..” why?” …. ” Well, cause it’s like a hug ” I said. … and then he said. I made this Green Pea, Smoked Ham Soup with Creme Fraiche Dumplings and it is so good. I don’t think Skater is ready for this one yet but one of the ladies I gave a bowl to said it reminded her of home and her Mother ! Oh…..now if only could get Skater to eat some. I have added frozen peas to this soup. This is completely optional however it makes the soup greener and gives it a fresh almost sweet flavour… you will love. Creme fraiche alone dolloped on this soup can also replace the dumplings if you don’t have the energy to make the dumplings. This is a wonderful soup in cold weather. Smokey ham and lovely soft dumplings make the perfect comfort food. Extra green peas keep the colour and the vitamins up. Add a little oil to a large pot ( or pressure cooker)and add the onion,celery,carrot, garlic and sweat till soft. Add the ham hock bay leaf and green split peas with 2 litres of stock. Put the frozen peas into the soup and bring up to the boil, just so the peas defrost then puree till very smooth. Add the meat and dumplings to the soup or serve on top separately. Put the eggs , butter, creme fraiche, flour and salt and pepper into the food processor with chopped chives. Blitz just till incorporated, pour this sticky dough into a container and refrigerate for up to 1/2 hour or longer to rest. (These can be made ahead of time and reheated in the soup or in stock). Form small balls with damp hands, then drop 1/4 of them into boiling chicken stock or soup until they float. Fish them out with a slotted spoon and cook another batch . These are also great tossed with ham hock and tomato sauce and covered in cheese. Serve the soup with the ham meat and dumplings on top with lots of parsley. 2.The dumplings are also great tossed with ham hock and tomato sauce and covered in cheese. Does this soup remind you of home or even a warm hug?. I hope so. 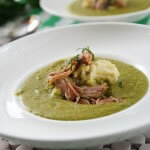 I love pea soup and the smoked ham and dumplings would just take it over the top. I have creme fraiche in the fridge too. Hi WSuzanne, hope your winter inNZ is being kind……I lovea good pea soup! You gotta love soup…I mean who doesn’t? 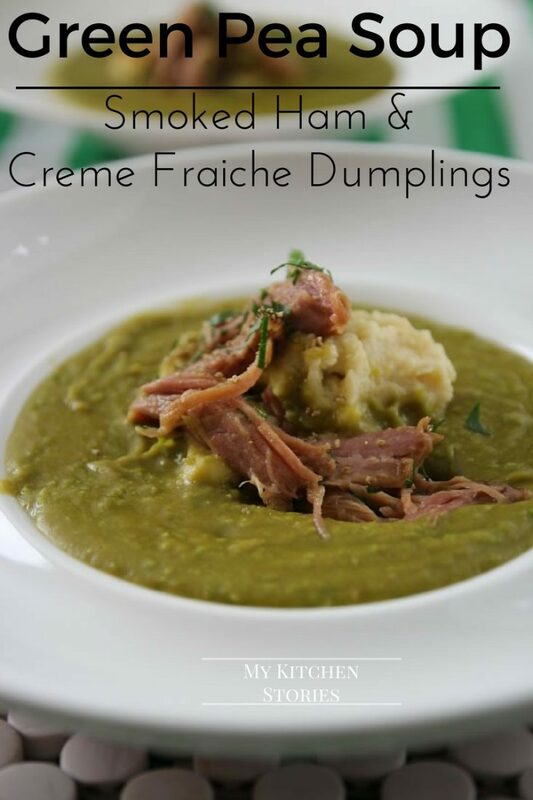 This looks amazing and I love those creme fraiche dumplings. What a creative and delicious looking soup! A healthy yet very satisfying and delicious soup. Right up my alley! This would definitely be a nice long, warm hug. I like to put frozen green peas into my soup as well to brighten the color. Robert is gonna love me! This does look lovely indeed! Thank you, can you eat this? Split Pea Soup is true comfort food to me, reminding me of my mother. I love the idea of adding these dumplings. Lovely update for a classic recipe. Usin the ham as garnish is a nice touch as well. Hi Victoria. it didnt really cross my mind that it was an up date but thanks I am pleased it is! Oh, wow, this looks amazing! Hi again, it was really good to meet and chat with you at the NNB2012 drinks. I’m so glad to have found you and your blog, I’ll definitely be back for more. They were very nice …. nice with cheese and tomato too! Nice soup Tania, maybe you were out of the country at the time, but your Mum used to make a pretty good Green pea Soup. It seemed like a pretty weird recipe years ago and it was pretty adventurous for her, it had peas, lettuce apples and curry. It was pretty good and I made it a lot a long time ago, thanks for reminding me. Oh wish I had tasted it! I haven’t been able to get enough of soups lately – we are not used to such cold weather in Perth & Im struggling! Glad to have another to add to the repetoire! This post made me a little teary. Yes, soup reminds me of my mother, especially soup with little dumplings like this. I’m glad you give your son plenty of hugs, culinary and otherwise.